You may remember that whilst I was in London, my friend Clarice and I made Nigella's Storecupboard Chocolate Cake, with cherry jam in place of the marmalade. Clarice then told me, very enthusiastically, that I should try it with sweetened chestnut puree sometime after I got home to Melbourne. That 'sometime' arose about 2 seconds after my short-lived detox. Nigella suggests dusting it with sieved icing sugar, but I was out of icing sugar. I thought it looked quite smart as it was though, honest and austere. It tasted good too - sweet and crusty outside, soft and dense centre. It's a plain, simple, chocolate cake, which only takes 10 minutes to prepare, and an hour to cook. Try it for tea-time, or anytime when your friends rock up at the last minute. They'll be impressed. Sarah, your cake looks really beautiful! It's on my to-do list! Yeah! I have a can of chestnut spread which I subliminally bought for this!Who needs detox when you can have choc cake! Looks wonderful! That's my fave version of that cake, too. how much chestnut puree would you suggest to put in for this?? i really want chocolate cake now!! 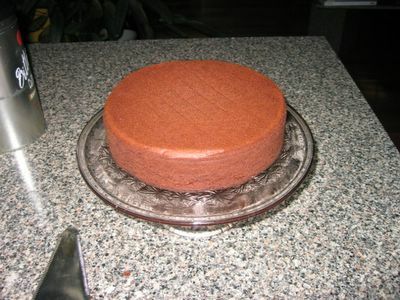 Ilana, I just put in the same weight of chestnut puree as the recipe says to put in of jam, and it semmed to work out ok! It was really tasty; hope you enjoy making it! I think I could eat that cake all by myself! Yummy! Alumbra's Gourmet BBQ or "Happy Birthday Mark!"